I had a surprise visit from Anna who grew up next door to me in Redding. We hadn’t seen each other in over 30 years. Incredible! Very fun to catch up over sandwiches and beer while looking out over Bucks Lake. In 2009 I needed to get to the Belden post office before it closed so I skipped stopping at the trail angels in Bucks Lake. I was not going to make the same mistake twice. Terry and Nancy Williams have the perfect personalities to host hikers. Sitting around the table on their deck and talking was just so nice. And the food was awesome…. lasagne, bread, salad, corn, beer, wine. A fire later made for a delightful evening. 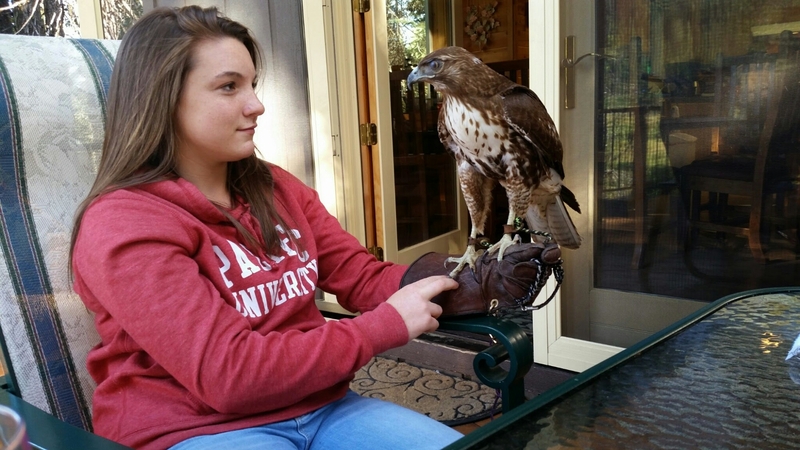 Their neice, Francie showed off her red tailed hawk, Jasper…. Their deck is huge and that is where the hikers sleep…. me, Atlas, Nature, Legs and Mongo. Nice group.